Patch 8.1 unlocked Paragon reputation and introduced a host of new rewards for those that continue to earn reputation beyond Exalted. However, there’s one big difference between Battle for Azeroth’s Paragon rewards and Legion’s offerings — there aren’t any mounts in those shiny new boxes. Instead, there’s a boatload of new toys, as well as a handful of Battle Pets. I collect both of these things, so I don’t really have a problem doing Paragon reputation, but I have to admit it feels like it’s…lacking, this time around. Honestly, the entire reason I was so gung-ho about Paragon reputation in Legion was specifically because of the mounts. To me, it made the grind worthwhile, even if it had its moments of disappointment when the box I earned didn’t contain whatever mount I was looking for. I’m all right with soul-crushing hunts as long as the prize at the end of all that grinding feels worth it. I’m not sure if toys and Battle Pets really fit that bill. I definitely want the music box from the Proudmoore Admiralty, because I really loved Jaina’s Warbringers short. I want Meerah’s Jukebox too, because who doesn’t want to hear a little ditty about Dolly and Dot every now and again? But the rest, while interesting, just don’t really feel like they’re worth all that extra effort. 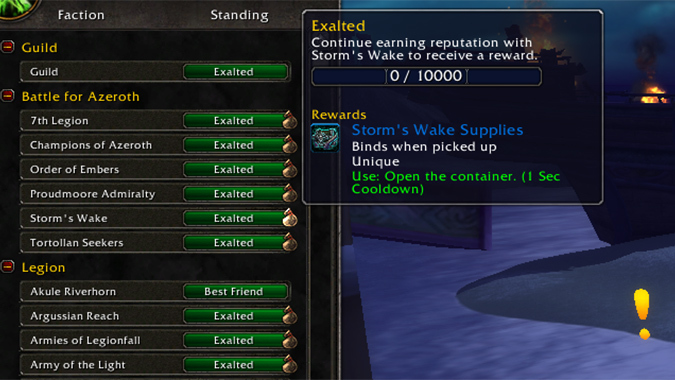 On the one hand, it’s nice to have some kind of rewards in place for continuing to earn reputation beyond Exalted. On the other, those rewards really need to be something extra cool to warrant the grind. Mounts fit the bill for me in Legion, and they would’ve fit the bill in this instance as well. Unfortunately, it seems like all the interesting mounts have been relegated to Warfronts this expansion — which hey, I’m not complaining about. I’m happy to grind for rare mount drops. It’s just that grinding out reputation isn’t the way to do it this time around — which leaves me wondering if I really want to put forth the effort into Paragon rep now. Toys don’t seem to do it for me, Battle Pets aren’t really doing it either — I think if some unique armor for transmog was hiding in those boxes, that might give me the extra nudge of motivation I’m looking for. But that’s me, and I’m kind of wondering how you guys feel about it. Are you working on Paragon reputation this expansion? Do you miss mounts being available in Paragon loot boxes? If you’re not working on Paragon rep, what would you consider sufficiently motivating as far as rewards go? What kind of reward would make you drop everything to work on Paragon rep?